WordPress has become one of the most common choices for people who are looking to set up their own blog or website. This demand stems from the various benefits of using WordPress: from the fact that it’s as free as websites can be (it’s entirely free to register an account, download the necessary backbone of your future website, and is free to use by anyone); its easy interface and user-friendly options that can be mastered with a little bit of effort, learning and patience; its extendibility by means of themes and plugins from both official WordPress developers and third-party developers affiliated with WordPress development; its search engine-friendliness and is safe and secured; its ability to handle different types of media; and its openness to various uses due to its open-source framework. For all of its merits, however, WordPress isn’t infallible – like everything else, it’s also susceptible to errors that can confuse beginner users or those who haven’t explored enough to know how such errors can be addressed. WordPress errors can range from petty, easy-to-solve ones to more complex and serious errors that can take a bit of extra effort to correct. Fortunately, seeing as WordPress is one of the easiest mediums that one can use, solving its most common errors can also be just as easy. Many of the WordPress errors that users can come across have also been seen, experiences, or diagnosed by web developers and other experts in WordPress usage. As such, the number of people who can you out with your errors grow continuously, and they are all willing to extend a helping hand to anyone who has trouble solving the errors on their own. 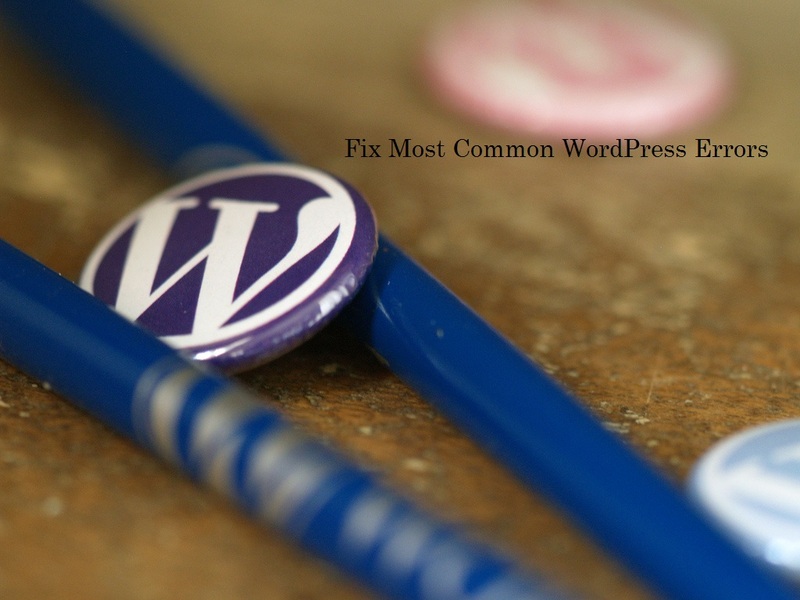 If you are using WordPress and are currently wrestling with the most common errors and the frustration of not knowing where your mistake(s) lies and what you can do to remedy the situation, or are just wary of what errors you might possibly come across, loads of guides and help for your WordPress site to get past these errors are only one click away. White Screen of Death – the error that results in a plain white screen with no information about the error. Internal Server Error – an error which usually appears when there is something wrong but the server cannot identify where the issue is. Error Establishing Database Connection – an error which means that your website is unable to connect to your database, which can be very tricky to resolve. 404 Error – a relatively common error by which the user is unable to access a single post on their website while all the other sections are working just fine. Locked Out Admin – this can occur if you forgot your password and you no longer have access to your recovery email. It can also be caused by a faulty plugin that tries to make changes to your admin section, or your website has been hacked. Syntax Error – an error that can occur if you have made a mistake while creating your PHP structure. It can range from forgotten symbols, misused symbols, or even functions spelled incorrectly. Login Page Redirecting/Refreshing – causes of this error, which appears when users attempt to login to their dashboard but are redirected back to the login page after pressing the login button, can be caused by incorrect values for the site URL and home URL fields in the WordPress options table, poorly configured permalinks settings, or faulty .htaccess file. Broken Issues – an issue with the site’s file permissions can result in this error that can manifest as broken images and failed uploads. White Text and Missing Buttons – this error happens when the WordPress visual editor’s buttons are missing or only shows white space instead of buttons. Learn more about these WordPress errors, what causes them, and what you can do to fix them with this infographic.